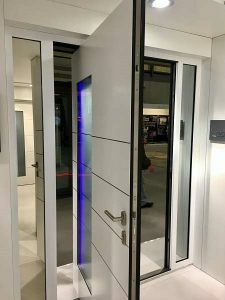 The NEW RK Door Systems Pivot door is now available to order! 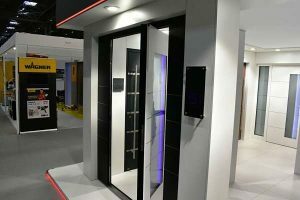 The door is due to be fitted into our showroom in Leicester on Friday 20th October. We can’t wait to get it installed! 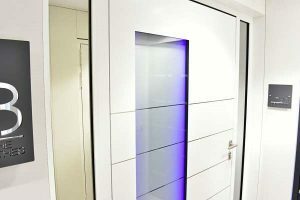 This design shown is based on the RK5110 with recessed handle, LED lighting, finger print entry, Bluetooth app control, metallic finish externally, white internally, overlaid sidelights with mirror backing & is 1900mm wide x 2200mm high. 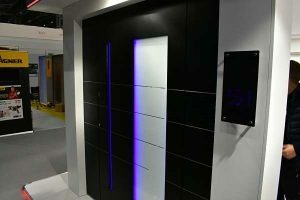 It really is a statement door & look forward to hearing customer’s views of it – as we love it! Be sure to add in the notes section you would like it based on the new Pivot door.